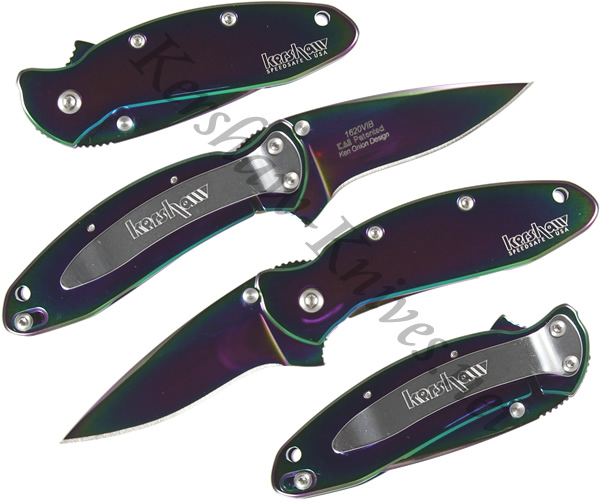 The distinctive finish of the Kershaw Ken Onion Rainbow Scallion 1620VIB is achieved when the titanium oxide coating is applied to the 420HC stainless steel blade and 410 stainless handle. SpeedSafe opening technology allows fast, reliable opening for both right and left handed users. Safety features include a liner lock system to ensure that the blade remains in position until the user releases it, as well as a tip lock that prevents the knife from opening when carried or stored. Additional features of the Rainbow Scallion 1620VIB include dual thumb studs, a removable carrying clip, and a gift bag.